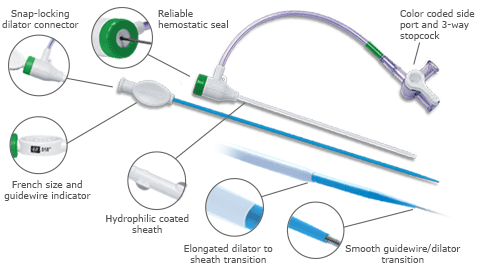 The Adelante® Radial is a hydrophilic coated introducer sheath system optimized for radial access, featuring the latest in hemostatic valve technology for minimal blood loss during guidewire manipulation, diagnostic angiography and percutaneous coronary intervention. The Adelante® Radial features a low profile kink-resistant and hydrophilic coated sheath for smooth and atraumatic insertion and removal of the device. The Adelante® Radial represents the latest and newest in low profile introducer sheath technology.